404 Marlborough is located on the south side of Marlborough, between Hereford and Massachusetts Avenue, with 402 Marlborough to the east and 406 Marlborough to the west. 404 Marlborough was designed by Snell and Gregerson, architects, and built in 1888 Neal & Preble, masons, as the home of Charles Edward Cotting and his wife, Ruth Stetson (Thompson) Cotting. They were married in April of 1888 and 404 Marlborough was built to be their home after their marriage. He is shown as the owner on the original building permit application, dated December 8, 1887, and on the final building inspection report, dated December 26, 1888. Charles Cotting purchased the land for 404 Marlborough on November 23, 1887, from Benjamin Williams Crowninshield and Walter Channing Cabot. It was part of a parcel with a 498 foot frontage on Marlborough, extending west to Massachusetts Avenue, that they had acquired on January 20, 1880, from John Brooks Fenno and William Storer Eaton. J. Brooks Fenno and William Eaton had purchased the land that same day from Grenville T. W. Braman, Henry D. Hyde, and Henry M. Whitney, trustees of a real estate investment trust that had purchased several parcels of land on March 1, 1872, from the Boston Water Power Company. Click here for an index to the deeds for 404 Marlborough, and click here for further information on the land on the south side of Marlborough between Hereford and Massachusetts Avenue. By the 1888-1889 winter season, Charles and Ruth (Thompson) Cotting had made 404 Marlborough their home. Prior to their marriage, he had lived at 249 Commonwealth with his parents, Charles Uriah Cotting and Susan Cordelia (Delano) Cotting. He was a real estate dealer investor and trustee, working in association with his father. Charles Cotting died in July of 1920. Ruth Cotting and their son, Charles Edward Cotting, Jr., an investment banker, continued to live at 404 Marlborough. They also maintained a home in Manchester, Massachusetts. In June of 1926, Charles Cotting married Constance Binney, a movie and stage actress. After their marriage, they lived at 410 Beacon and in Manchester. Ruth Cotting died in December of 1926. On November 30, 1927, 404 Marlborough was purchased from Ruth Cotting’s estate by Ella Blanche (Messenger) Smith, the wife of Carl Mayhew Smith, an oil salesman. They previously had lived in an apartment at 46 Hereford. 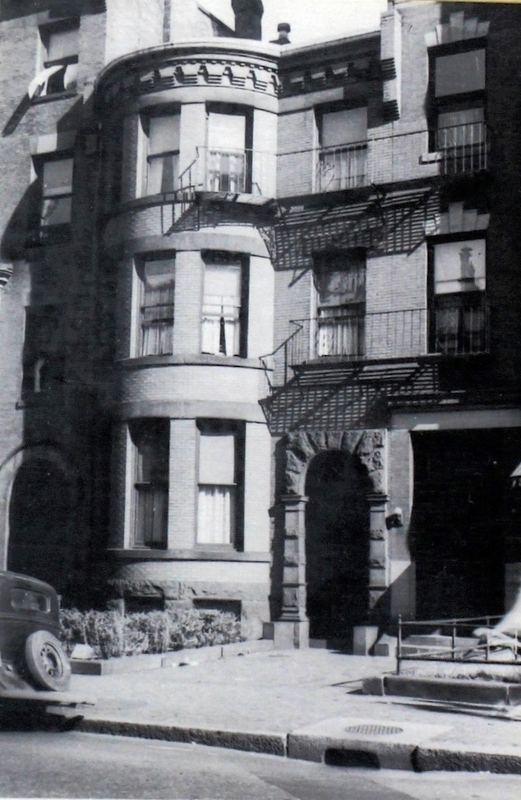 In February of 1927, prior to taking title to the property, Carl Smith applied for (and subsequently received) permission to install fire balconies connecting with 406 Marlborough. After moving to 404 Marlborough, they operated it as a lodging house. In August of 1943, Ella Smith applied for (and subsequently received) permission to legalize the occupancy as a lodging house, noting that it had operated as such (and been licensed by the Boston Licensing Board) since 1928. The Smiths continued to live at 404 Marlborough until about 1952. On January 30, 1952, 404 Marlborough was purchased from Ella Smith by George Edwin Dunphy and his wife, Eleanor Mae (Topliffe) Murphy Dunphy. They had married the previous year. They continued to operate it as a lodging house. Eleanor Dunphy’s parents, Harry Ogden Topliffe and Genevieve A. (Cowell) Topliffe lived at 404 Marlborough in 1952. They previously had lived in Belmont and resumed living there by 1954. On June 16, 1954, the Dunphys transferred the property into Eleanor Dunphy’s name as trustee of the 404 Marlborough Street Trust. The Dunphys separated by the mid-1960s. Eleanor Dunphy died in March of 1994. 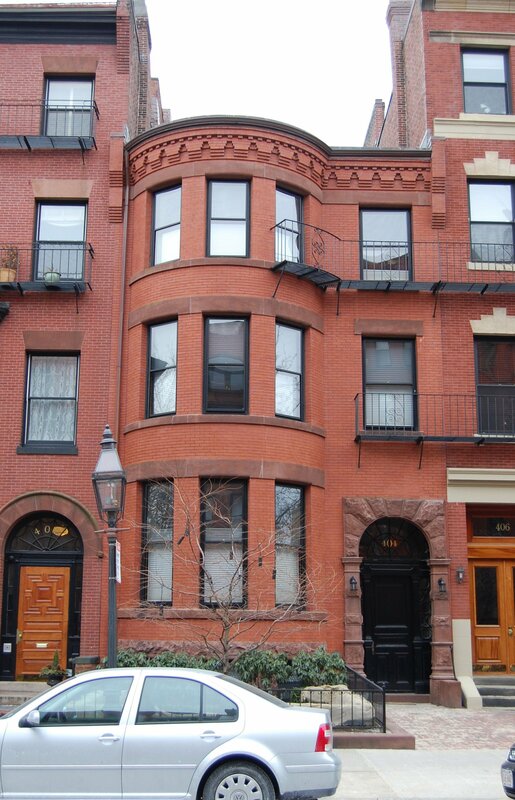 On October 3, 1995, the 404 Marlborough Street Trust transferred 404 Marlborough to the sole beneficiary, Genevieve Elaine (Ginger) (Murphy) Denham Marlin, the wife of John Paul Marlin, Jr. She was Eleanor Dunphy’s daughter by her first marriage, to Edward J. Murphy. 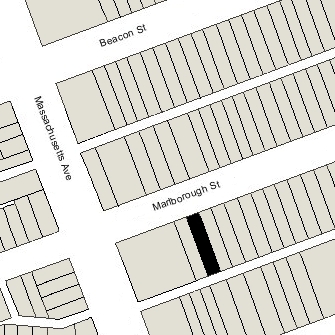 On May 15, 2007, 404 Marlborough was purchased from Genevieve Marlin by the 404 Marlborough Street LLC (Stephen P. Najarian, manager). On July 17, 2008, it converted the property into seven condominium units, the Topliffe-Murphy House Condominium.